The conditions and storage time of some ammunition can make it particularly dangerous to handle. The Risk&Co Group, through its Geomines Business Unit, offers governments technical assessment services for their ammunitions (missiles, bombs, shells, grenades, etc.). They assess their level of risk, their storage conditions and the necessary measures for transportation and destruction. Experts from Geomines, formerly members of the French armed forces, also have databases that are updated daily and all the skill-sets and certifications necessary for the technical assessment of the condition of ammunition and for planning its demolition. A preliminary visit of the storage premises is imperative to inventory the munitions. Geomines’ experts determine the security measures to be put in place for transporting the ammunition, identifying the firing range along with local authorities and defining the conditions for delivering the ammunition to the site. They assess their client’s requirements of explosives and devices and define a protocol for the disposal and reclamation of inert waste. The technical ammunition assessment operations and demolition procedures carried out by Geomines comply with operator safety rules and are based on the International Mine Action Standards (IMAS). The pyrotechnic analysis carried out makes it possible to calculate the safety radii, entry prohibitions and sensitive points. Where appropriate, an analysis on the transportation of ammunition from the storage location to the demolition site is also carried out. It defines the material transport requirements (ammunition-handling robot, container protection to limit risks in case of detonation, etc.) and the most appropriate route to reach the firing range. Geomines’ staff members work safely and offer customers a very high value-added service. The expertise provided by Geomines is the basis of the demilitarisation process. 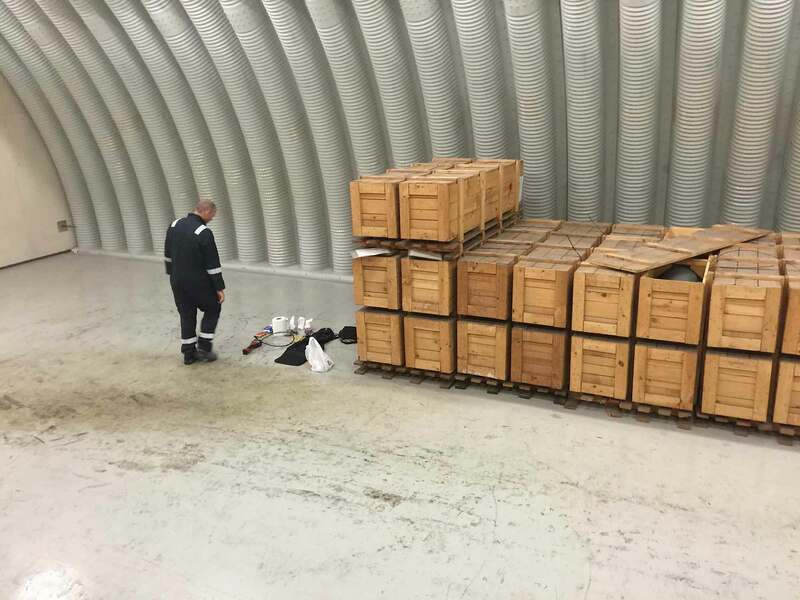 The results of the inspections undertaken make it possible to conduct pyrotechnic analysis and firing plans. Geomines’ teams propose the inspection of each piece of ammunition using an X-ray machine. The inspection thoroughly analyses all the ammunition’s components and assesses the exudation degree, composition anomalies and their location very precisely. It limits handling and transportation risks. The Risk&Co Group also assists its clients with all services related to mine clearance, from conducting probes and pyrotechnic diagnoses to explosives’ clearance operations.